In this week’s Dream Overseas Report, Angel McCoughtry signs a contract with a new club, Shoni Schimmel might join her sister Jude on an overseas team, Reshanda Gray’s club continues to struggle and Sancho Lyttle and the All-Star squad at Russian club UMMC remain undefeated in the Russian league with a 79-point victory. Last weekend, Ajavon’s team got its first win in the Polish league on the very day she joined the roster. This Sunday, Energa Torun played undefeated Sleza Wroclaw on the road and won 80-78! From what I can read, it appeared to be a battle between Ajavon and Sharnee’ Zoll (who last played for the Sky in 2013). Zoll picked up three fouls early on the game and became a non-factor. Torun led 76-66 after 35 minutes and almost coughed it up when Sleza went on a run late in the game, but Ajavon and Paulina Misiek hit free throws late in the game to seal with win. Burdick’s Napoli team came to Parma undefeated after two games but was upset in an 82-72 loss on Sunday. Lithuanian center Gintara Petronyte scored 28 points/8 rebounds in the loss for Napoli while Burdick played 33 minutes and scored eight points and nine rebounds. Burdick’s teammate Noelle Quinn added 10 points. Leading scorer for both teams was Parma’s Christine Clark (Harvard 2014) who had 32 points in the Parma win. On October 15, Carter’s TTT Riga team played the visiting Austrian Flying Foxes team in the second game of a two-game series where the best aggregate score qualified for Eurocup. Riga lost to the Foxes 54-48 but the aggregate score was important, and over two games Riga outscored their opponents 133-111 to advance. All TTT Riga had to do was play the Flying Foxes relatively evenly, and they succeeded. Carter led her team with 13 points followed by Kristen Mann with 10 points. Aayrn Ellenberg, an Oklahoma State player who played two games with the Chicago Sky in 2014, scored 24 points for the Foxes. Chastity Reed, an ex-member of the Tulsa Shock, had 17 points/14 rebounds in the Flying Foxes loss. TTT Riga and the Flying Foxes were the only two teams that had to win their Eurocup spot through a play-in series. The Latvians will play the opening round of Eurocup against Turkish team Orduspor on October 29. On Thursday Cortijo’s Gigantes de Carolina team beat Morovis 75-70 in Carolina’s first home game since September 19. Morovis might have taken the game from Gigantes but Tamera Young missed a 3-pointer with 32 seconds remaining and when Cortijo’s team missed the follow up shot Morovis failed to get the defensive rebound. It took two free throws by Cortijo with five seconds left to put the dagger in Morovis’s shot at a win. Yolanda Jones (Louisiana-Lafayette 2007) was the leading scorer for Gigantes in that game with 22 points and Cortijo had 14 points. For Carolina, four players scored in double figures led by Young with 17 points. On Sunday night, Carolina took on Isabela and won 82-61, with five players scoring in double digits. I couldn’t find out what Cortijo’s contribution was but her team moves to 11-2 and remains in first place in Puerto Rico with the victory. Dantas’s Corinthians/American team played a mini-series of three matches over the weekend with Brazil league teams. On Friday, they took on Sao Bernardo and won in a 99-45 rout with Dantas scoring 16 points. On Saturday, Corinthians beat Presidente Venceslau 102-56 in another rout with Dantas leading her team with 27points. Sunday, Dantas and her teammates had a tougher go of it but beat Santo Andre 77-74 in the final game to sweep the tournament. Dantas had 19 points in the win. Unfortunately, I’m not able to find any box scores here. Supposedly, Corinthians and Santo Andre will play each other again on October 24th. Reshanda Gray is 22 years old and she’s the oldest player, believe it or not, on her very young Battipaglia squad that is still looking for its first win in the upper league as they fell to Ragusa 72-54 on Sunday. Battipaglia were never in this game, down by 10 points after one quarter and down 45-19 at halftime. After picking up her fourth foul in the second quarter, there was little that Gray could do to help her squad. Gray’s 21 points/7 rebounds led her team, and the top performer for Ragusa was the Connecticut Sun’s Camille Little with 27 points/9 rebounds. After rescheduling due to political violence in Ankara, Hayes’s squad finished Group A play in the Turkey Cup on Tuesday. They lost to Adana ASKI 82-80 but finished 2-1 overall in Group A. They led at halftime but Adana ASKI came on strong in the third quarter. As late as 24 seconds left Yakin Dogu led 78-77 but Ceyda Cinan hit a shot with two seconds left to make the score 82-78 and put it out of reach. Erika de Souza, former Dream player, led Adana ASKI with 25 points/16 rebounds. For Yakin Dogu, Kelsey Bone had 25 points/6 rebounds and Alyssa Thomas had 19 points/11 rebounds. Hayes shot 1-for-6 from the field but hit all of her free throws to finish with nine points. As one of the top two teams in Group A, Yakin Dogu will proceed to a Turkish Cup quarterfinals game. This weekend, the Turkish League began its regular season and Yakin Dogu played Gelistirenler. Yakin Dogu squeeze out an 82-78 victory for their first domestic league win. The third period was decisive, allowing Yakin Dogu to take a 66-57 lead and hold off a fourth quarter comeback. Alyssa Thomas hit her free throws at the end to clinch the win. Hayes scored 26 points to lead all scorers in the Turkish League in Week One. Alyssa Thomas scored 20 points/12 rebounds and Kelsey Bone had 11 points/12 rebounds (but 4-for-20 shooting). For Gelistirenler, Marija Rezan led with 25 points, followed by familiar names Lindsey Harding (8 points), Farhiya Abdi (12 points) and Alex Bentley (15 points). A Kelsey Bone fast break! Henry’s team came into the last Group A game on Tuesday against Edirne, and left winless at 0-3 losing to Edirne 66-65. Ivory Latta of Edirne hit a shot with four seconds left to put Mersin away for good. As the team in the Group A cellar, Mersin is eliminated from the Turkish cup. Latta finished with 20 points/6 assists for the winners. Bria Hartley had 23 points/7 rebounds for Mersin, and Henry had 19 points/9 rebounds. In the opening round of Turkish League play, Mersin faced powerhouse Abdullah Gul and lost 76-73 in the regular season opener. It’s hard to find out much about this game, so I’ll leave the box score to tell the tale. Four players scored in double digits for the winners, led by Janel McCarville (17 points) and LaToya Sanders (16 points). For Mersin, Bria Hartley had 24 points and Marina Kuzina had 23. Henry finished with 7 points/11 rebounds and was 7-for-8 from the free throw line. Mersin is struggling…but it looks like they’ll be getting some big help from a new addition pretty soon. More on that below! In addition to the Russian Superleague, UMMC plays in a pan-European league of the best pro teams in Europe – naturally, called Euroleague. 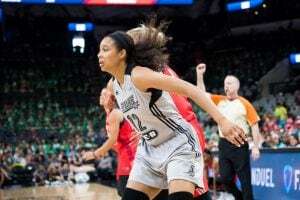 They traveled to France to take on French superpower Bourges in front of 4800 spectators and won 65-58 on the strength of Brittney Griner and UMMC’s power in the paint. An 8-0 run early in the fourth quarter gave UMMC the distance it needed to break the deadlock. Griner led both teams with 17 points and 10 rebounds. Also scoring in double figures were Sandrine Gruda (13 points), and Diana Taurasi (11 points). Lyttle finished with two points and five rebounds in 21 minutes of play. In domestic league play, UMMC crushed Spartak Noginsk 120-41 to move up to 3-0 on the regular season. (The league record was set in 2001 with 136 points scored, by UMMC.) UMMC scored 30+ points in the first and final periods and held their opponents to single digits. According to Jonathan Lintner at the Louisville Courier-Journal, it’s possible that Shoni Schimmel will be playing in Israel in the off-season with her sister, Jude. The Israeli season will possibly open on October 26 in a split-season format. Israel is not much larger than New Jersey, so the siblings might spend time together between games. Turkish sports sites are reporting that McCoughtry has signed a one year deal with Turkish club Mersin. 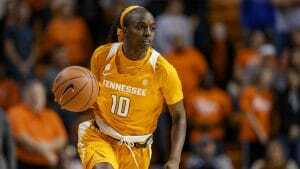 She will be joining her Atlanta Dream teammate Aneika Henry in a few days. McCoughtry was previously a very popular player for Turkish club Fenerbahce. Mersin is currently 0-1 in Turkish league play.